Want to Dine on the Water… Onboard a Floating BBQ Donut? There’s an Awesome Outdoor Art Fest in Dubai this Month! Adventure Zone, as the name denotes, is the place to go if you’re looking for awesome adventures! From climbing walls to zip lining to making your way through caves, there’s just sooo much to do there. Whether you’re up for knocking down some bowling pins, jumping on trampolines or playing arcade games all day, Dubai Bowling Centre is a fun experience for all ages! Trust us, you can spend an entire day here without getting bored. Everybody has been raving about this newly-opened indoor theme park ! The rides at Warner Bros World Abu Dhabi are all themed around the epic DC Superheroes (including Batman, Wonder Woman, Flash and Superman!) as well as our favourite animated characters like Scooby Doo, Flinstones and Tom & Jerry. Always wanted to learn how to fly? A mix of sky diving and bungee jumping, iFly Dubai gives you the chance to defy gravity in an indoor vertical wind tunnel! If that’s not cool enough, iFly has just launched a new iFly VR 2.0 flying experience, which lets you fly at some of the world’s most beautiful locations. Another new indoor theme park in the UAE is Tridom in Ras Al Khaimah. 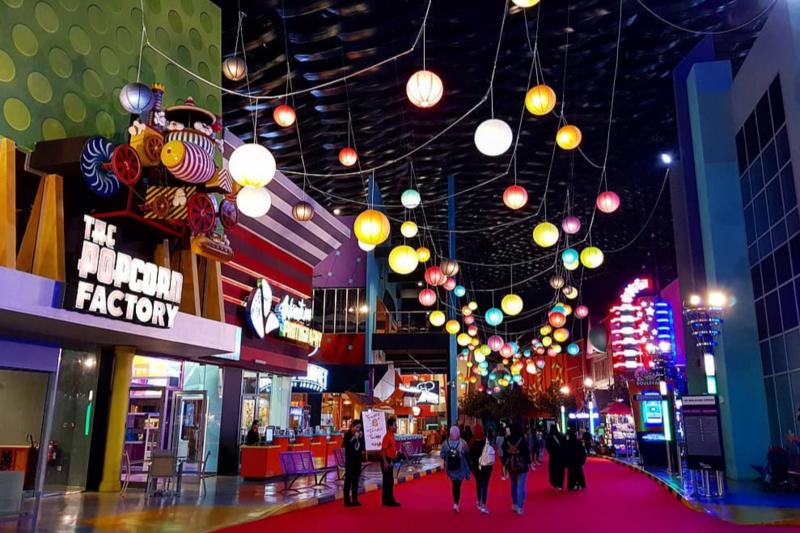 They’ve got fun rides and attractions for all ages, including the largest indoor play area in the UAE and the tallest indoor drop tower (130 ft!) in the Middle East! If you and your little ones love being active, then you need to try out the Ninja Warrior Challenge at Dubai Sports World this month! There are two courses, one for pros and one for the beginners (and the kids), and you’ll need to complete all the fun obstacles to reach the end. Here’s what happened when we tried out the course with Dubai’s very own Ninja Warrior. If you’re a Marvel, Cartoon Network of Jurassic Park fan, you are going to love IMG Worlds of Adventure! The rides and attractions are so much fun, you’ll want to go on each at least twice. Some of our favourites are the Velociraptor, Predator, Spider Man: Doc Ock’s Revenge, Thor’s Thunder Spin, Powerpuff Girls and the Haunted Hotel… If you’re heading there during Eid, you’ll even get to see all your favourite characters come to life.